2nd Saturday in January, Catalina Island, CA, 5 AM Start. Click Avalon above for info and registration. Club 15% discount code FHFRUN. 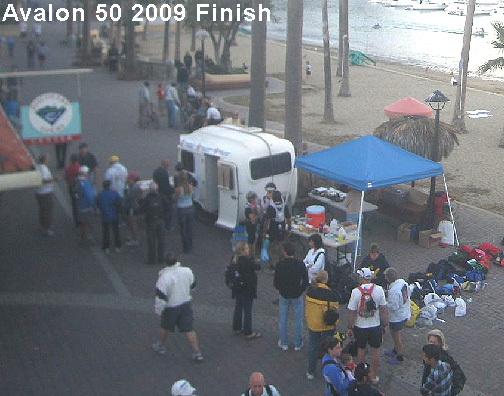 Photo on the right of the finish line was a screen grab off of the Pavillion Lodge web cam. In 2012, out of 18 club finishers the range was: Jannifer Heiner 7:53, Denh Vuong 17:59, Chris Goddard 7:58 and Roger Brown 16:50. 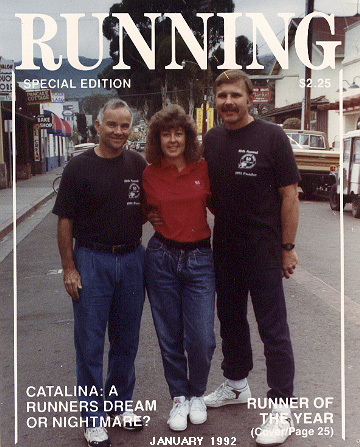 Read Competitor Magazines Bob Babbitt's article on Why Run on Catalina. 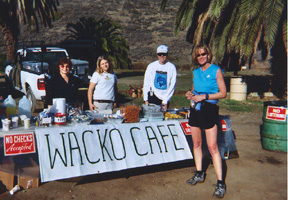 See Suzy Degazon's blog on her experience and photos at the Wacko Cafe aid station. This is a great first 50 mile, but tough. Estimate double your Catalina Eco Marathon or High Desert 50K time, or add 2 hours to two times your LA Marathon time to figure if you can do it within 12 - 13 hours. 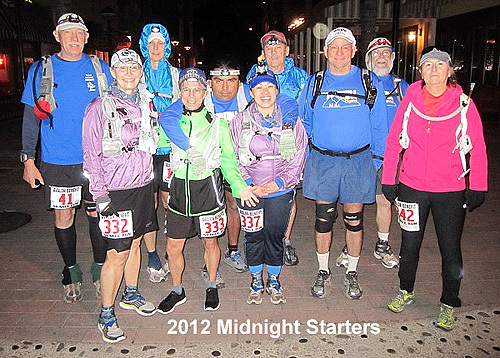 There are two official 50 Mile starts - 4am and 5am - and a 6am 50K start. Everyone must check in at the start with their bib numbers and also at some of the aid stations, especially to qualify for age group awards. You must finish and be off the course by 5pm, and there are cut offs at the last few aid stations. Some aging veterans of this event can do an earlier start under certain conditions: see the early start web page for details. An alternative is to do the 50K which was introduced in 2017. 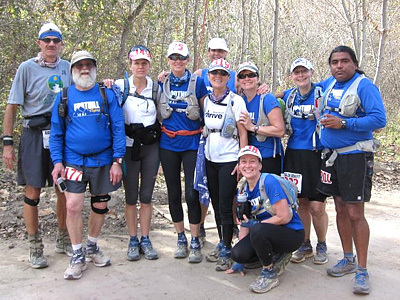 Great course for first trail 50 just to finish - See the Team Couch Potato first ultra training web page and the TCP Avalon 50 training schedule. Use the Catalina Eco Marathon in November, High Desert 50K in Ridgecrest in December and Weekend Warriors for training runs. 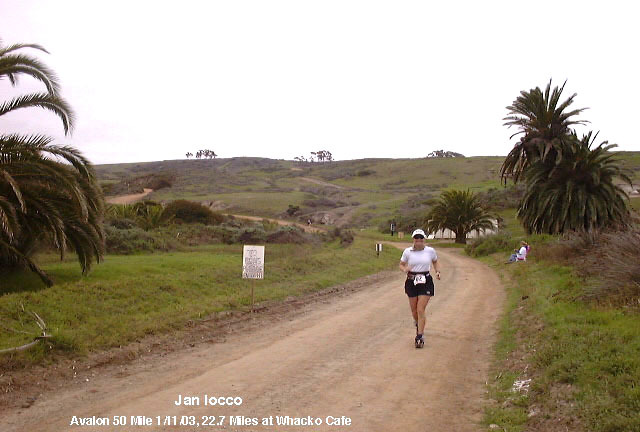 If you like the March Catalina Marathon, then you will love this 50 miler with some additional trail through Rancho Escondido down from the airport that the marathon doesn't have. 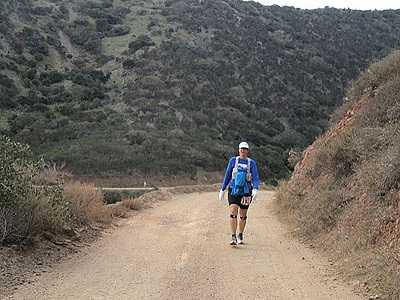 The 50 Mile also skips the steep section of the March marathon between the 1st and 3rd marathon aid stations. 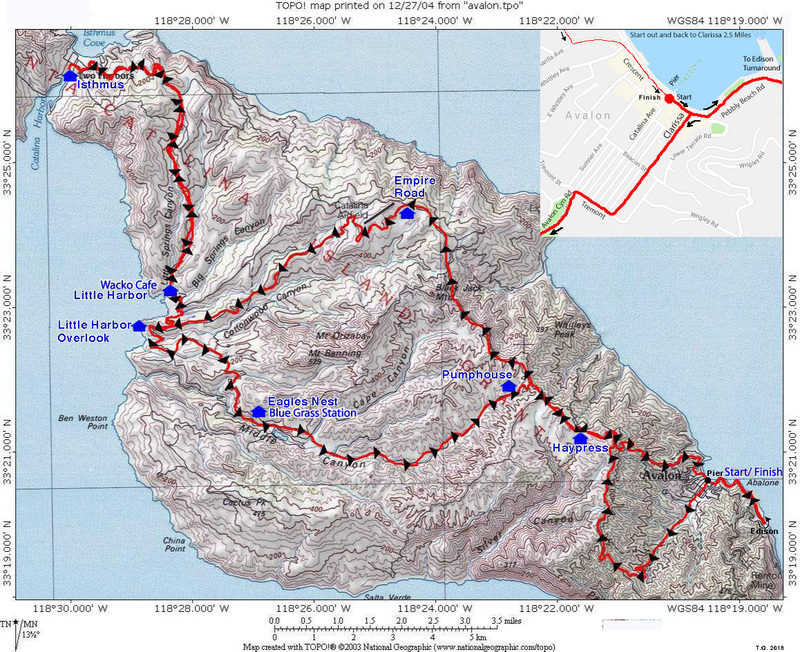 A landslide on Pebbly Beach Rd necessitated exchanging the 2.5 mile start out and back in 2004, to one at the Isthmus. 2018 will return to this start out and back. It's very scenic looking across at the lights of the mainland for the first 2 hours as the sun comes up, buffalo grazing on the hills, Catalina Channel and Pacific Ocean sides of the island as you run out to the Isthmus and back to Avalon in a modified figure 8 course. The aid stations are fantastic. On the way back at the Wacko Cafe, you can participate in the horse shoe or roping contest - test your coordination or lack of after 33.2 miles. At Eagles Nest (mile 38.8) you can listen to blue grass music as you get a beer and a buffalo burger. 2012 they even had lobster. The new 50K starts at 6:00am (11 hour cutoff) and follows the 50 Mile course. The split comes just before the Little Harbor Overlook aid station - see the map above and 50K Elevaton Profile. 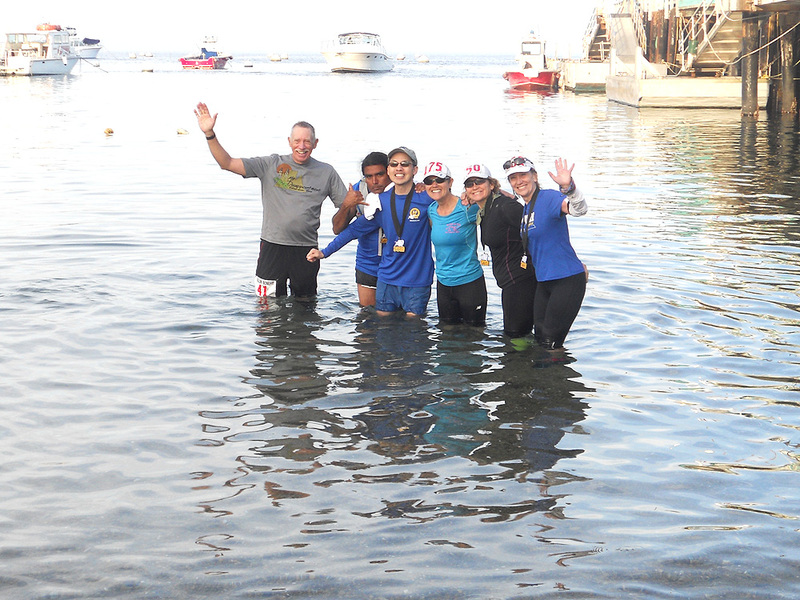 The 50K was created for those who have heard all the great stories about the experience, or have done the Catalina marathons, but are not quite ready for 50 Miles on the island. Also there are the aging vets of the 50 Mile who can't make the cutoffs any more but want to enjoy the camaraderie of the weekend with other ultra runners. Aid stations are well stocked with water, 50-50 Gatorade, soda, fruit, pretzels, M & M's, Gummie Bears, and some have special stuff like potatoes, peanut butter & jelly sandwiches, trail mix, beer, BBQ chicken, etc., and are 4 to 7 miles apart. You can pack a drop bag with lunch or special snax and drinks and leave it at packet pickup Friday evening. Write your name and race number on a piece of duct tape and place on the bag for easy ID. The Wacko Cafe aid station people will haul it out to Little Harbor and have it there for you and they are sorted by color. This is the only manned aid station you pass through twice - miles 21.2 and 33.8. I suggest a 2 bottle or hydration pack with energy foods you like to eat (I ate one mini Snickers Bar every hour), salt or succeed tablets (one per 2-3 pints of fluid), Ibuprofen (600 mg at the start and 400 every 3.5 hrs) and Tums (every 2 hrs or when I feel a cramp coming on). I put a thermos of chicken noodle soup in my drop bag. But after having worked the Wacko Cafe aid station, I have seen everything but the kitchen sink in the drop bags there. Drop bags are returned to the start line around 3:30PM. You will have til 6:00PM to clean up and then attend the race banquet followed by the awards at 7PM. Yes, please sign up for the dinner. Temperatures vary from 40 to 75 degrees. Most wear both a long and a short sleeve shirt plus a nylon shell if windy or possible rain. If it feels like you are getting too warm, you can peal off in layers and when you get to the Wacko Cafe aid station, stash them in your drop bag. It can be 5-10 degrees warmer going through Middle Ranch Canyon from Eagles Nest to Pumphouse. It is a tradition just after you finish to walk into the bay up to your waist - it really is good for your tired muscles.....honest. So pack some comfortable shoes to change into, extra sweatshirt, small towel and a few bux in your drop bag for after your finish or have some one meet you with them at the finish line. Many also put 5 to 100 bux in their drop bag to put in the Wacko Cafe tip jar which goes to the Avalon Benefit charity. The food at the awards banquet has been very good the last few years and is well worth going to, so don't just crash soon as you get in. Everyone gets a finishers medal and there are age group awards 3 deep. Plaques are given to those who finish a total of 5 and 10 races, jackets at 15, and 1000 mile belt buckles for 20 finishes - none have to be consecutive years. There are special awards given out like for the winners of the horse shoe and roping contests, Spirit Award, and to those who raise the most pledges. You might even have enough energy to go to Luau Larry's or El Galleon for a few celebratory mai-tai's and karaoke after. Sunday morning all the finishers gather near the pier for a finishers group photo just before 8:00 AM then go to breakfast at Jack's or the Pancake Cottage. It's fun to stay at a hotel with other runners. The most popular in recent years is the La Paloma - Las Flores. The rooms and cabins are reasonable and you can get a returners discount. If you want to stay on the main beach front street, there are the Hotel MacRae and the Pavillion Hotel. A half block off the beach is the Atwater Hotel. Vacation Rentals has condos and houses you can rent for the weekend that have multiple bedrooms, and if you can get others to share the cost, can be less cost than a hotel room. See the Avalon Chamber of Commerce website for other hotels. Fastest boat ride - 1 hr - is from the Catalina Express terminal in Long Beach - (800) 613-1212, when you hear the recording, punch 3 to get a live person. Take Friday off if you can and join many of the runners on the 9:50AM boat from the Downtown Long Beach Landing. If you can't, there is a 7PM boat. Return Sunday on the 11:45AM or get a late checkout and relax til the 3:45PM boat. Car pool if you can to save on the $19/day parking fee. 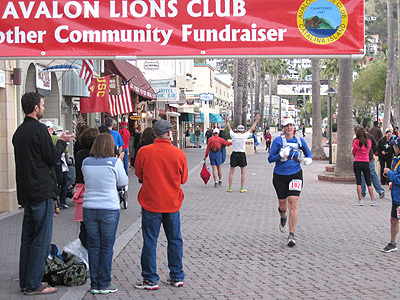 A race is something a runner sets out to win, or set a personal best time, For me the Avalon 50 miler was an adventure. So let the adventure begin. Team Couch Potato/Foothill Flyer's meet at the Catalina Express on Friday. January the 13th. We were all sharing out thoughts of what to expect. 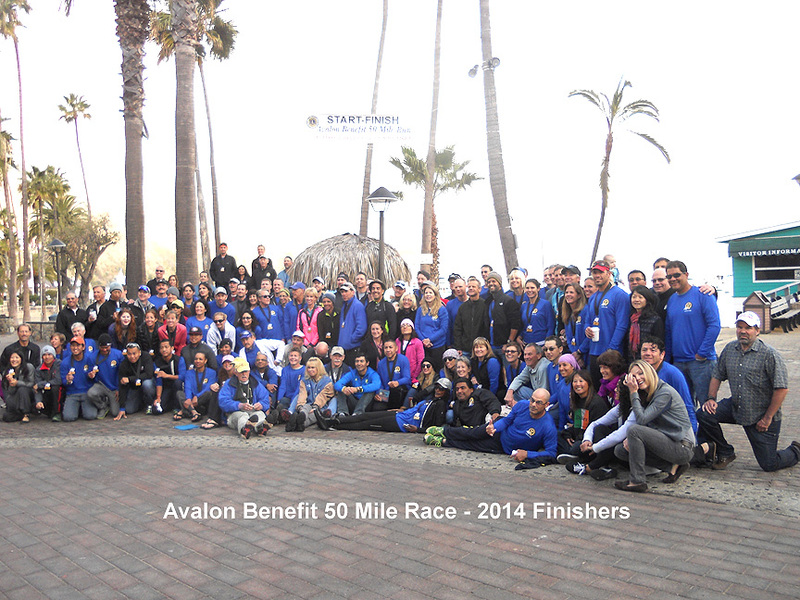 Some were sharing their own experiences of past Avalon 50s'. For me my stomach was a nervous mess. Once on the island, we checked into our rooms and made plans to meet again at 4:30 for a team picture and dinner. After dinner, we made our way over to package pickup. It was fun standing in line with the elite runners, some have done this many many times, and others, like myself, not really knowing what to expect. Once we got our bibs we made our way back to the room for a short but well needed catnap. For 10 of us the real adventure would begin at 12am, for 5 others it would begin at 2am, and the rest at 5am. Is it really time to start? I could not believe it. I, not a night person, was in running shoes; my bib was on (#182), my head light on and shining in the direction of the hills. So we are now off. It's 12:01am January 14, 2012. I AM CRAZY. 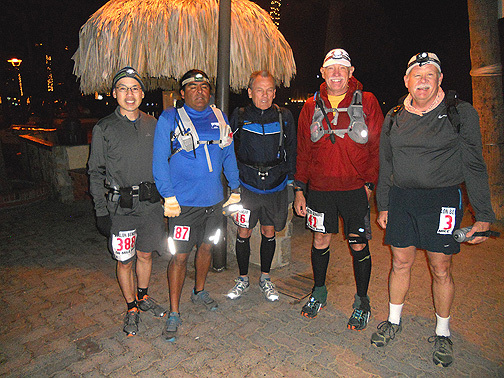 December 4, 2010, I did my 1st Ultra with Tom O'Hara - the Ridgecrest 50k. While out on the trail with Tom, I learned so much about other races. 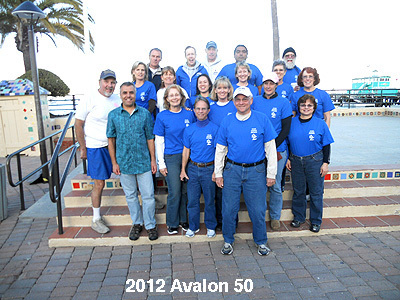 One being Avalon 50, Tom wanted to do it again for his 70th b-day; how could you say NO to Tom. So that day the seed was planted and I knew I would be doing this race. The 10 that started at 12:01am where in for a treat, Mom nature was kind to us, the night air was perfect for running/walking. The stars were incredible, and the Moon helped light the night. During the night for the most part we stayed together, we had 3 groups, Bob & Roger in the lead. Robert, Maria, Denh, Maureen, Tom and I in the middle and Chris in the back. Jimmy however could not make up his mind where he wanted to be, he would show up in different places, He was with the lead, then with us, then in the back, then back in the lead. Jimmy was a great supporter whereever he was. Now we all did the 1st 26 miles with no aid stations, Tom over the 7 months of training drilled into us what we would need for those 1st 26 miles. When out doing the ECO marathon in November, Tom took note of where we could get water during the night. So for the most part we were ready. My pack before I filled it with water weighed in at 6lbs. It had my trail mix, protein shots, 2 five hour energy, my drugs, etc., with more waiting at the drop bag site at mile 34. I would have to say now that I packed too much. I really did not know what to expect, but I felt that the 1st 26 miles were the easiest. It was so beautiful we could hear the night birds, the crickets singing. At the top of the 1st hill you could see down below us the lights of Avalon. The oceans water was still, and lights on the main land twinkled in the distance picture post card perfect. Bob and Roger tried to wake up a sleeping Buffalo, They did radio to us where the sleeping buffalo was. We were just getting ready to topping off our water bags. As we passed him our lights shined in his eyes. We now are on Buffalo watch as well as rock watch. As you know Avalon 50 for the most part is on the fire road, so as I walked/ran, I was watching the road in my dim of light. Thanks Denh for your light, Denh's very bright headlamp could help land an airplane. I turned my head light off around 6am, and in the still of the morning I enjoyed the peacefulness of the morning. 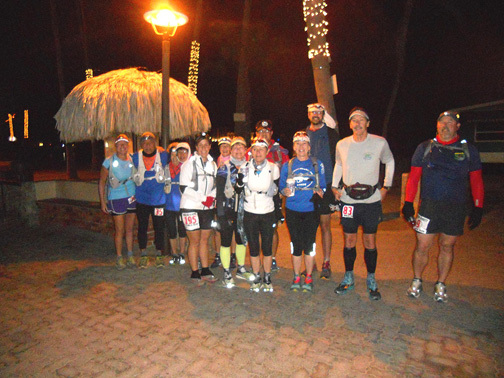 At 5am the Race began, in Avalon, I am not sure at this time where on trail I was. I do know that I was in 2 Harbors at the Aid station when the 1st place runner came past me. I was getting Gatorade and the guy working the Station took down his number and said same as last year, and made a comment on how he did not stop for aid, this was just passed 8am, I have now been out over 8 hours did a full marathon with no aid, and he flies passed as if it was a stroll in the park. I am now off to the turn around 1.3 miles further. I get my check mark and head back down the hill. At this point I did not know the hardest part was in front of me. 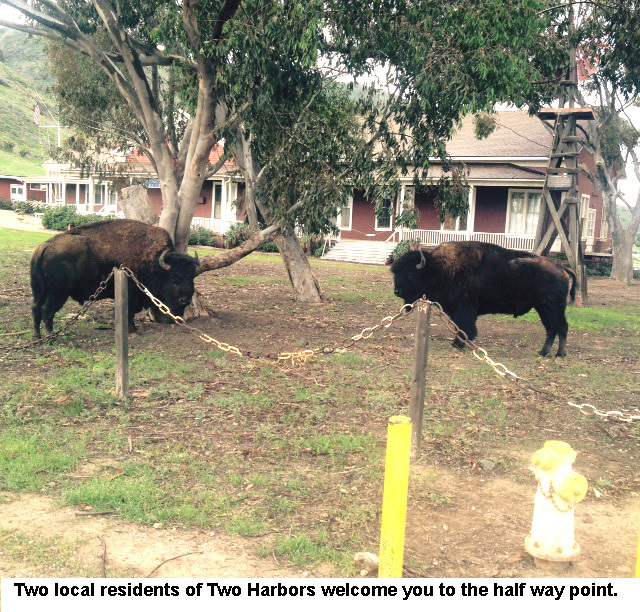 The hardest part of the race was leaving 2 Harbors. That climb up the hill seem to go on FOREVER. What made it fun was seeing all the Foothill Flyer's and friends going down the hill as I was slowly going up the hill. Wow, I made it to the Wacko Cafe - 34 miles done. I ate my peanut butter sandwich, drank my protein drink, changed my socks and on my way I went. I now have 16 miles to the finish line. To date I have never done more then 33.2 miles, so what is 16.8 more. I could do this. This is where Tom should have been with me, He did not tell me just how hard it was going to be from Wacko Cafe to the Finish line. Did I say hard? I really can't explain how I felt; my emotions were all over the place. I was proud of myself for even being out there. I was enjoying the beauty of the Island. I was enjoying seeing my friends as they passed me. What I did not enjoy was how long the climb was. Mily Cyrus has a song I love called the Climb, I could have used that song to get me up and over the top of the hills but I could not use my Ipod. So there I was for the most part the 16 miles by myself, Each time a runner passed me they would give words of encouragement. If you have never done a long race, you have no idea how a simple gesture of looking good helps. It really does, even if you know you look like crap. I make it to the next aid station mile 38. Here is where I first wanted to call it a day. What did I have to prove to anyone, that I would kill myself by doing a full 50 miler. Now my feet hurt and with my right foot felt raw. When I came into the Eagles Nest aid station there were many Flyer's and that helped me a lot. All I wanted to do was sit and see what I could do to my foot, to help me get back out on trail with only 12 miles to go. My friend Hope came over to me and she and the gentleman who was pouring water on our heads worked on my foot. I sat a there a few minutes ate some potatoes and salt, and off I went. With each step I could feel the pain in my foot, I had to make it to the next aid station, (pump house) 6 miles to go--I could do this. I can't count how many times I wanted to cry. I am so very grateful to all the wonderful runners out there that helped me along these 6 miles. As I was on this part of the race, I saw Judy, aka Magic. Magic was with her Mom, and husband sightseeing and looking for us crazy runners, I called to her and she came running up to me, I almost lost it again as she hugged me I could feel my eyes tearing up. She told me I could do this and set me on my way. I now made to the Pump house. As I walked to the Pump House aid station, I could not see the last hill in front of me, All I wanted was to sit down for 5 min regroup and be on my way. 6 more miles to the finish line, I have now done 44 miles. I really wanted to throw in the towel. I was done. I had no more in me, my foot hurt with each and every step I took, As I sat there drinking coke and eating more potatoes and salt, I heard an old but loving voice. My Mom was sitting there on my shoulder. She was telling me how when she was 49 years old she made her way out of the Grand Canyon at 100 steps at a time. Now I had heard this story many years ago, but here I was sitting at Pump House not wanted to stand up, all I wanted to do was cry and my Mom came to my rescue. I stood up asked how far to the next aid station - 2 miles. I started to count 100 steps and I stop. 100 steps and stop. I made it to the top and could see the aid station down below me. I could hear the workers cheering on those that passed on up this climb. You guess it, I wanted to cry again. I was talking to myself coming down into the Haypress aid station saying: you can't cry, better not cry, you can't let any one see you cry. 4 more miles to go. I have now done 46 miles. I took out my cell phone; I was still believe it or not doing well. I think I could finish this under 17 hours. At this point all I wanted to do was get down to the finish line. Now when I left Two Harbors I though that climb out was the hardest part of the race, well I can't make up my mind if that was the hardest or was the last 4 miles the hardest. Who would think going downhill would be hard. Let me tell you Tom was correct for not telling any of us how hard this was going to be because none of us would have done it. At this point My foot was screaming with pain even before I put it back down. As I was walking along, could not run, hurt too much, a runner came up from behind me and took my hand. Dutch was so kind. She held my hand, told me what a great job I was doing and that I can make to the finish line. Her words helped me so much, as Dutch took off you guessed this time I did lose it. The tears came and I could not hold them back. It was one foot in front of the other. The finish line is less then 3 miles away....I could finish this in under 17 hours. As I made it down that forever long down hill there was a young man. We started to talk and he asked me how far to Avalon. He asked me about the race and offered to give me Gatorade and Aspirin. He told me it was his 21st b-day, I wished him well and kept moving forward, one step at a time. I think God had him on that road at that point for a reason, and it did help me. Now I have less then 2 miles to go. I can't see the finish line but I can see Avalon, and a new voice is in my ear - Eric LeClair. I hear him telling me you are there the finish is just ahead, leave nothing in you, leave it all out here on the road. So I start to run again, each step hurting more then the last. I am now down the hill and I see the finish line. I hear the cheering. I am going to do this. I have done this. It is over and I am alive. I am a finisher. And I AM NOT GOING TO CRY. I AM DONE, NOTHING LEFT IN ME. I want to put my feet in the ocean, I crossed the finish line took off my pack and walked right into the OCEAN, AND IT FELT GREAT. Sixteen hours 50 minutes, It has to be the hardest but most rewarding 16:50 of my life. Will I do it again not in your life. I will keep doing my Marathons and Ridgecrest, But anything over a 50k will never be done by me again. So a Race is for the person that wants to win, Avalon was a wonderful ADVENTURE that I am very proud to say I finished on my own two feet, with the help of many wonderful runners, volunteers and old but loving voices in my head. To all of you I am grateful. 5 am start, in the dark, on an out and back beginning at the green pier where the marlin are brought in. Then we begin a relentless climb that takes us past the Wrigley Memorial and onto a dirt road. We can see flashlights winding along the switch backs for miles ahead. Eventually, when we can look down behind us, it's nice to know we're not last 'cause we can see a long trail of flashlights behind us as well. Once morning dawns, we are about 7 miles into the 50 mile race and on a ridge. On the right we look down on Avalon Bay, and there on the left, is England. Well, what else could it be?! Buffalo. "Here buffalo ... nice buffalo ... lemme get just a little closer so I can take your picture ... nice buffalo ... I won't hurt you ... Hey, Jan! I think this one is snorting at me!" "Yeah? I don't hear anything. Let me just lean my ear in here next to the big guy's face ... WHOA!!" Suddenly, he's charging us!! Jan turns and runs while I just stand there, too dumbfounded to move! I found myself putting my hands on my hips and stomping my foot like when neighborhood dogs come out of their yards barking and expecting a chase. Jan thought I was being brave (or maybe an idiot), but it was just an unconscious response to the charge. Fortunately, it worked! He pulled up abruptly just a few feet from me, snorted, and shook his head as if to say, "Enough, move along now!" We gladly complied! Tom is right about the aid station at mile 18.9 and again at 33.2. It's a life saver! We handled the turn around at Twin Harbors okay. But then it's about a 2 mile climb out of there to begin the trek back. Jan had us playing "childish mind games" where we'd take turns picking where we'd start running and at what spot we could resume walking. "Okay, at the big bush on the left we'll run until we get to that right turn way up there by the palm tree." "That big bush right there?" "Yeah, until the palm tree." "Okay." We played that game for what seemed like forever and it worked! We climbed right out of that hole in pretty good time and headed into Tom and Mary Ann's haven - the Wacko Cafe! Leaving was the hard part. The next few miles got rough. The childish mind game didn't seem to be working anymore. Jan said we weren't suppose to have down times at the same time, but at different times so that we could pull each other along. But that's what happened at about mile 36. We just got sluggish! 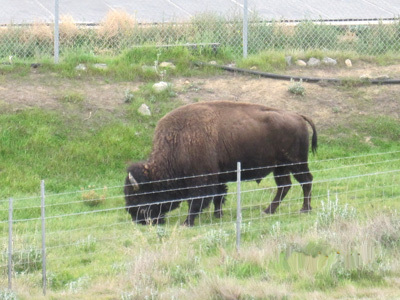 If it hadn't been for another buffalo incident, we may have stayed sluggish even longer. But having been charged once, we were a little gun shy when a HUGE buffalo came around the corner, followed by a smaller buffalo, waltzing along the road like he owned it! We were heading right for each other! Jan said she wasn't going any farther and I said maybe we could stay way to the left, but the buffalo was coming up the hill zigzagging across the entire road. Maybe he didn't like us anymore that we liked him because just before we had to do SOMETHING, he did something. Just as calm as could be, he went straight up the embankment on the right and out of sight. We were astonished that the two of them could go up something so steep! The adrenaline rush kicked us into gear for the long, never ending stretch that Jan called "middle ranch". Brush and canyon walls on both sides obstruct any view so that every turn looks the same. When think we can't stand it any longer, there are the switch backs to climb out of middle ranch and back onto the ridge where at last the ocean can be seen again! Last: the treacherous, quad burning, toe jamming, 3 mile screaming downhill eucalyptus lined tour bus road. Brutal!! Absolutely brutal! But when we pass the bell tower and wind by a few last residences, a right turn at the bottom and there we are on main street! A 100 yards from the finish line and a great welcome!! It's an incredible feeling of accomplishment!